Telltale's Tales from the Borderlands is on display at E3 2014, and features editor Wes Fenlon got a first look at the Walking Dead developer's newest game. 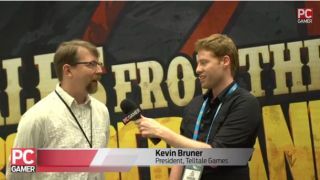 Here, Wes talks to Telltale president Kevin Bruner about how the studio started collaborating with Borderlands creator Gearbox Software, and how the team switches up the mood from zombie survival to sci-fi comedy. Be sure to read more from E3 2014 all this week.